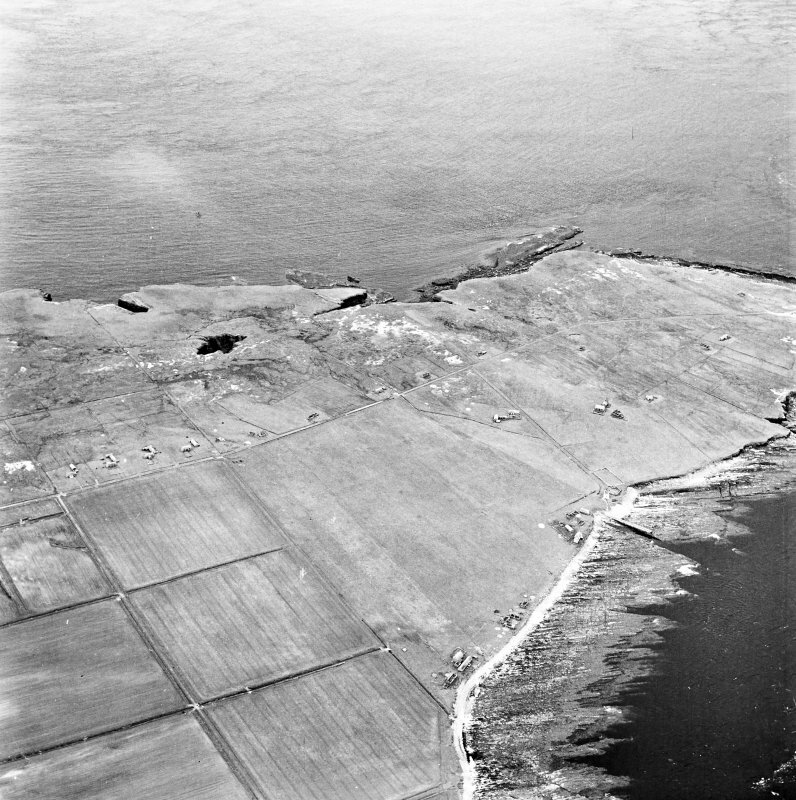 Stroma, oblique aerial view, taken from the E, showing Nethertown township in the centre of the photograph. 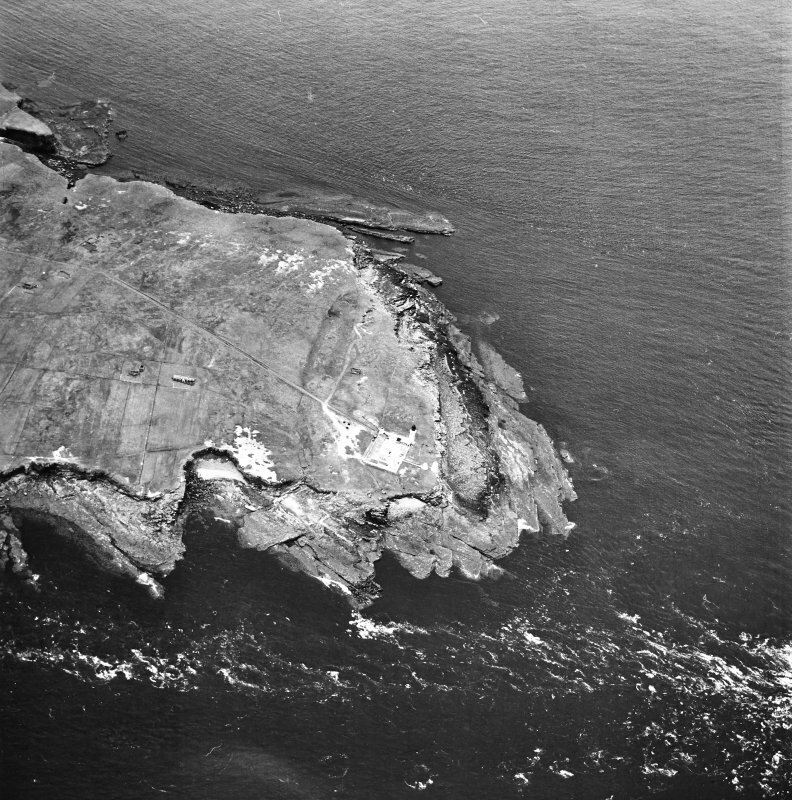 Stroma, oblique aerial view, taken from the W, showing Nethertown township in the centre of the photograph, and Bught o' Camm promontory fort in the bottom left-hand corner. 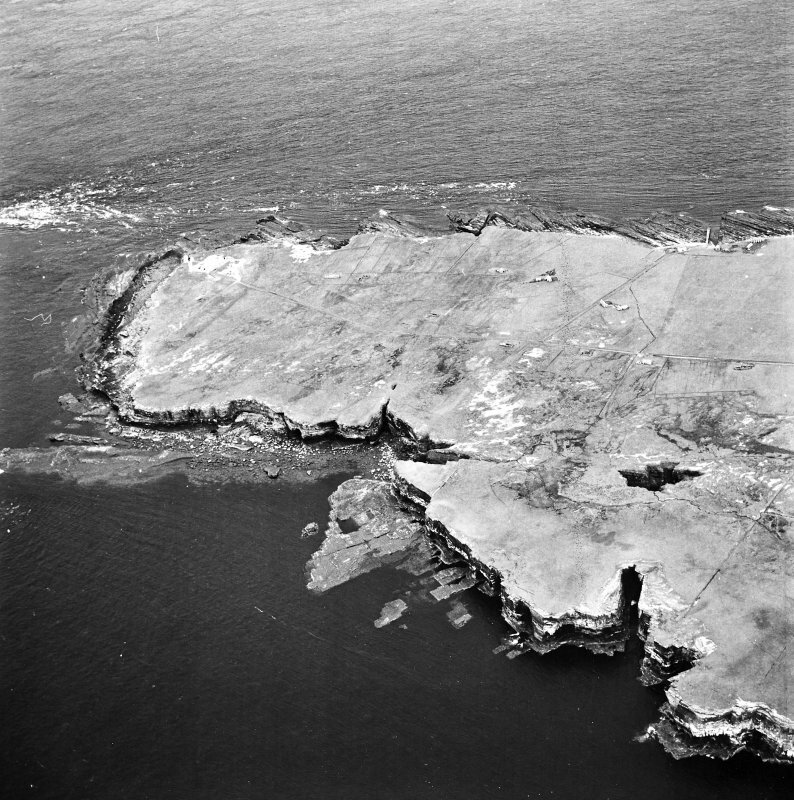 Fortified promontory on W side of Stroma island. Information from E McGillivary, Librarian, Kirkwall, Orkney to OS, 1 May 1973. ND 3498 7855. 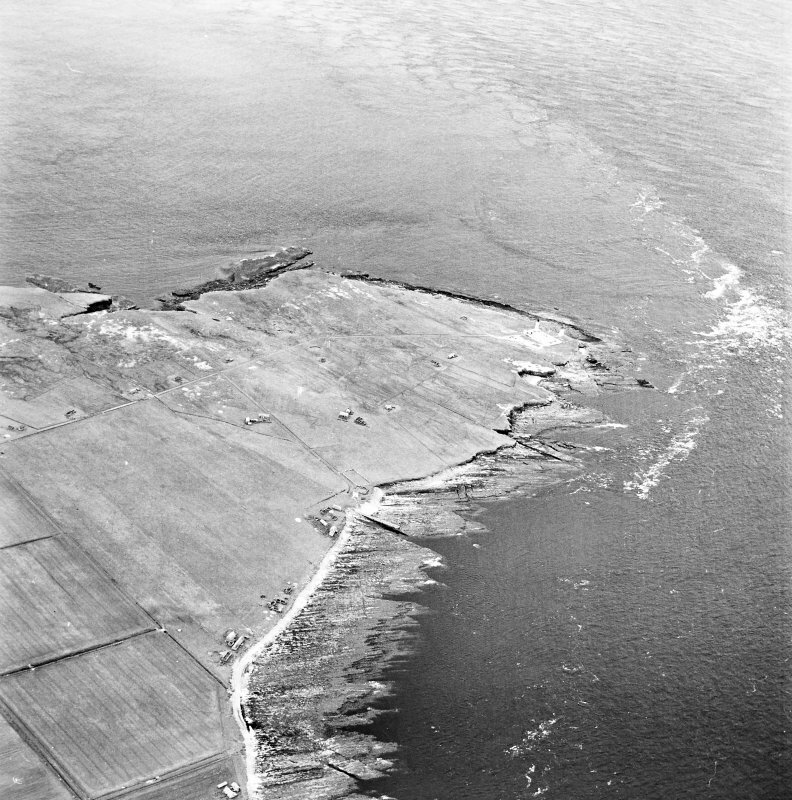 A fort consisting of an earth and stone rampart blocking off the sheer-sided, level-topped promontory of Bught o' Camm to enclose an area some 70.0m N-S by 30.0m transversely. The rampart stands 1.0m high on the landward side and has an average spread of 6.0m. Towards the W end, stripping of the inside of the rampart has revealed slab-facing; at this point a width of 2.3m can be estimated. In from the E end is a 3.0m gap that may be an original entrance, but could be a later break. To the E of the gap, the rampart has been partially quarried away. There is no evidence of any structures within the fort. An early-modern drain follows the outside edge of the rampart to veer away towards the W.
Visited by OS (J M) 8 July 1982. 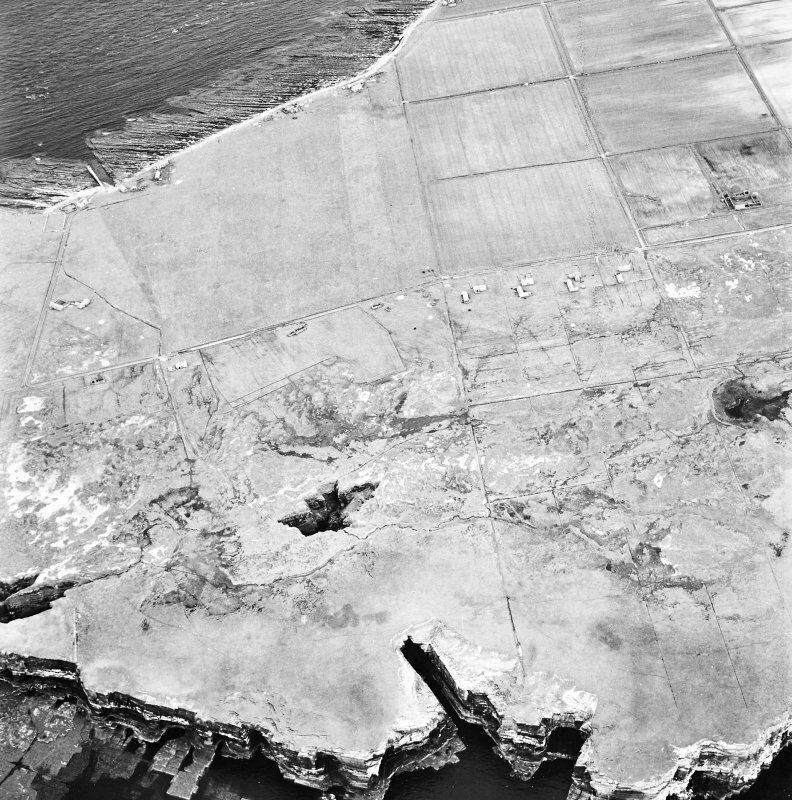 A sheer-sided promontory on the cliffs forming the W coast of Stroma has been cut off on the S by a single wall reduced to a bank some 6m in thickness by 1m in height; erosion at the W end had revealed the inner face of the wall in 1982 when it was surveyed by the OS, who estimated that the wall was about 2.3m thick at this point. A gap near the E end may mark the position of the entrance. The interior, which is roughly triangular on plan, measures about 65m from N to S by 60m transversely immediately to the rear of the wall; it is featureless.